Bharat Sanchar Nigam Limited (BSNL) announced Prepaid bsnltariffs revision under GSM Mobile services. Migration to the Roam Free plan and General Plan will be through the Plan voucher. 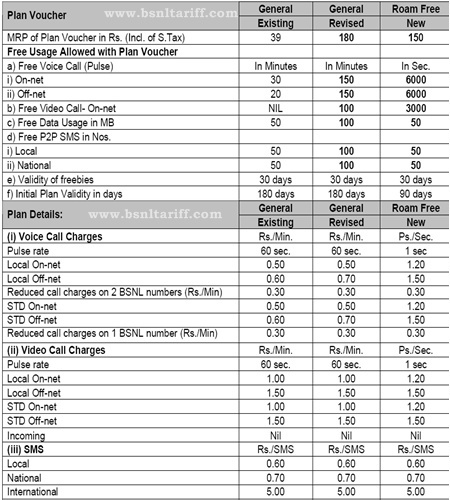 A new Plan Continuation Voucher of Rs.34 with a plan validity of 180 days offering freebies of 50 Min (3000 sec) -On-net + 20 Min (1200 sec) - Off-net voice call to be consumed within 30 days is hereby introduced for extension of plan validity of Per Sec plan, Per Min plan and General plan is introduced. The existing plan vouchers will be used only for migration and plan activation. For special plans including Roam Free plan, extension of plan validity will be through plan voucher only. According the instructions issued by the Telecom Regulatory Authority of India (TRAI) the validity are to be complied with for Assam, J&K and North East LSAs areas. 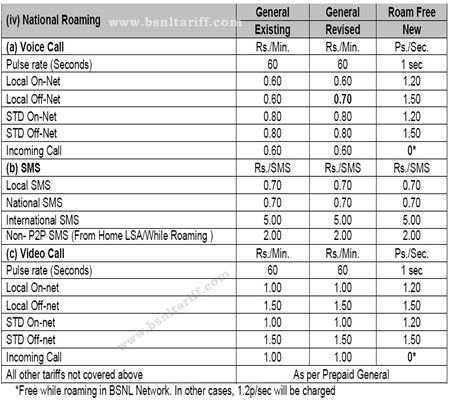 The above revision bsnltariff will be implemented with effect from 01-05-2012. Necessary instructions were passed to the concerned Telecom Tariff circles to implement the same.